This month, we’d like to spotlight the cleaning of floors of commercial buildings. These floors get an abundance of foot traffic (in all kinds of weather) and inadvertent damage from objects being dropped on and dragged or pushed across them. 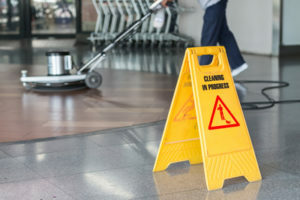 Properly maintaining the floor of your commercial building requires more care and attention than a quick mopping with soapy water whenever the floor looks dirty. A floor that is properly maintained and clean fosters a professional image for your place of business. That image goes a long way in attracting new clients and maintaining old ones. Additionally, properly cleaning your flooring also reduces the risk of accidents. Slips, trips and fall injuries make up almost 20 percent of all job-related injuries. We’d like to address some of the common mistakes that business owners make when cleaning the hard floors of their commercial properties and what are some best practices so that you avoid damaging your floors when you clean them. There are right ways and wrong ways to clean your floors. A knowledgeable floor cleaning company will practice the former and will avoid the latter. Do you have vinyl flooring? Concrete? Wood? Brick? Something else? Cleaning company employees will know exactly how specific floor types should be cleaned, leaving your floor as clean and attractive as possible. Having your floors cleaned by people who are unfamiliar with the proper cleaning techniques for your individual flooring will likely lead to damaged floors when the cleaners are finished. People may follow the maxim, “More is better,” while cleaning, but when it comes to harsh chemicals, this is a terrible idea. People who are not familiar with the type of chemicals necessary to clean your commercial flooring and who are unsure of the proper amount may use the wrong type or too much. The wrong chemicals or too much of them (or worse, both) will lead to damaged or destroyed floors. Cleaning companies that know which chemicals your floors need and how much of them to use will ensure that your floors are cleaned properly and not damaged during the cleaning process. Excess dirt, dust, and other debris should be swept up before cleaning machines or tools are used to ensure that the machines or tools are able to make the necessary contact with the floors and clean them. If the floors aren’t swept of the excess gunk beforehand, the machines can respread the dirt, resulting in areas that need to be cleaned again. This will lengthen the cleaning process and make it costlier for you. Failure to do the proper prep also gets equipment dirty; that is yet another reason that dirt, dust, and debris can be unhelpfully spread around your floor. People who are not familiar with cleaning processes may not read the safety notices and warnings of whichever cleaning chemicals that they are using to clean your floors. This could lead to misuse, which could cause injury, illness, or worse to the cleaning crew, your employees, and your clients. Additionally, if people who are cleaning do not put up signs alerting others to wet floors, people may slip and fall. Hiring a cleaning company that is familiar with the potential hazards associated with cleaning chemicals and that engages in best safety practices ensures that your floors will be cleaned properly and safely. Using the wrong cleaning equipment for a particular type of flooring can damage or ruin the floor. As we noted above when discussing preparation of the floor for cleaning, dirty equipment can result in dirty floors, and possibly damaged ones, too. Ensure that the cleaning company you hire has equipment that appears to be in good condition and is clean. Not regularly cleaning your floors means that small problems can grow over time, and present bigger or impossible cleaning challenges later on. Stains, for instance, may be harder to remove the longer they’ve been present. A small crack may grow. Regularly cleaning your floors and examining them for potential problem spots and attending to issues as soon as you see them means that your floors will retain a “brand new” appearance and durability for a long time to come. If your floors can be sealed and are not, you may also want to look into having that done, as it will further aid the cleaning process. ServiceMaster Clean is looking forward to helping you with your commercial floor cleaning needs! Call us (540-251-4023) or contact us via our website.